Move oven rack to lowest position; heat oven to 350°F. In extra-large glass or metal bowl, beat all cake ingredients with electric mixer on low speed 30 seconds. Beat on medium speed 1 minute. Pour into ungreased 10-inch angel food (tube) cake pan. Bake 37 to 47 minutes or until crust is dark golden brown and cracks are dry. Immediately turn pan upside down onto heatproof funnel or glass bottle. Let hang about 2 hours or until cake is completely cool. Loosen cake from side of pan with knife or long metal spatula. Turn cake upside down onto serving plate. In chilled large bowl, beat whipping cream and powdered sugar with electric mixer on high speed until stiff. Fold in ginger. Cut cake horizontally in half to make 2 even layers. Spread half of the filling on bottom layer; replace top of cake. Spread remaining filling on top of cake. Sprinkle with additional pumpkin pie spice if desired. Don't have crystallized ginger? Mix 1 teaspoon ground ginger with the powdered sugar when making the filling. A serrated or electric knife will help you cleanly cut the cake into 2 layers. Use these knives for slicing the cake as well. 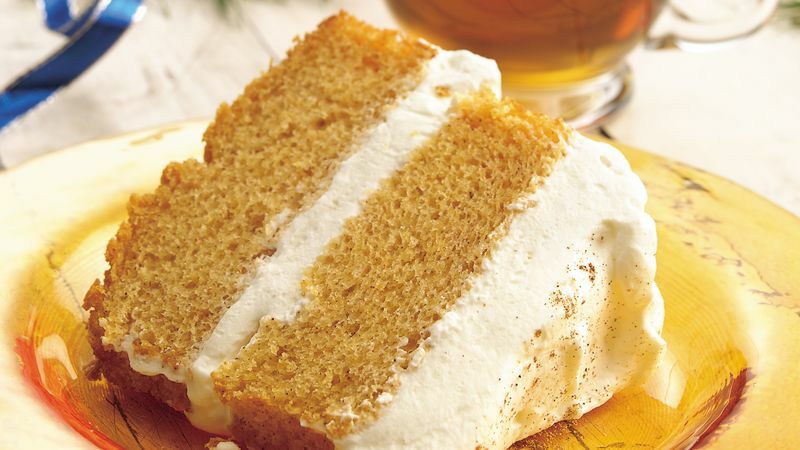 Save a step or two by just cutting the cake into slices and topping with the filling or topping with frozen (thawed) whipped topping and garnishing with the chopped crystallized ginger.